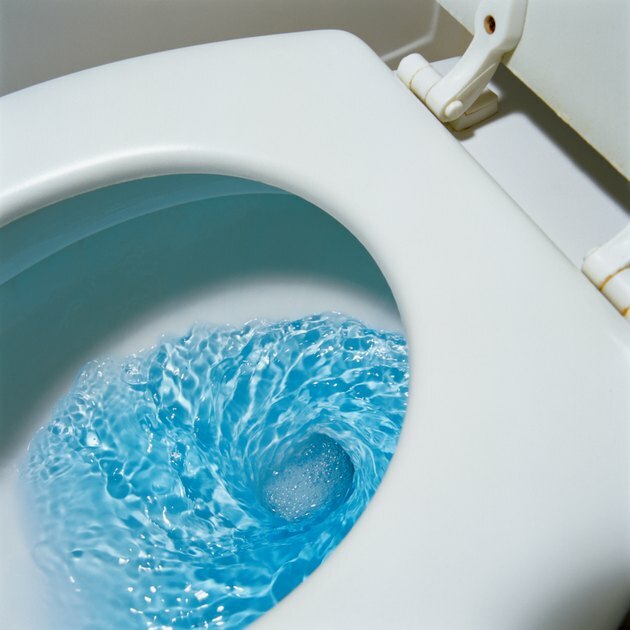 Servicing a toilet that runs randomly will stop the annoying sound and help lower the water bill. There are several potential causes for the running problem, which can be determined by inspecting some of the tank's components. A minor adjustment or a quick cleaning may be all that is required. If a defective part is discovered, chances are good that the replacement part will be fairly inexpensive. In many cases you can make the repair without hiring a professional. You may be able to resolve the running problem within just a few minutes. Lift the lid away from the tank. Lengthen the lift chain if necessary. The lift chain attaches the back of the handle to a rubber disk on the bottom of the tank called a flapper. If the chain is too tight, the flapper may not be sealing the opening on the bottom of the tank completely. The chain should have approximately 1/2 inch of slack at its midpoint. Adjust the chain by unhooking it from the handle and rehooking it onto one of the next highest links. Replace the float ball, as it may be leaking. As its name suggests, the float ball is the large rubber or metal ball that floats on the water within the tank. If the ball leaks, it will lower gradually and cause the toilet to run. Turn the float ball in a counterclockwise direction with your hand until it detaches from its threaded rod, then tighten the replacement float ball onto the rod until snug. Adjust the float height. If the float does not rise high enough as the tank refills it will not shut off the fill valve, causing the tank to run. For newer floats that rise vertically along a metal tube, compress the spring clip on the side of the float and slide it up or down as needed to adjust the height of the float. For older floats with a rubber ball on the end of a metal arm, either adjust the set screw on the end of the arm or bend the arm manually if no screw is present. Clean the valve seat to remove any burs or sediment deposits. Some toilets, particularly older models, are fitted with a metal valve seat within the base of the tank. A triangular-shaped rubber stop fits into the opening of the valve seat to form a seal. If the seal is not complete, the toilet might run after one use but not after another use. Turn off the water supply handle located against the wall and flush the toilet to drain the tank. Lift the rubber stop out of the valve seat and pass an emery board across the edges of the seat to remove burs and deposits. Insert the rubber stop into the seat and turn on the water.